Professional wrestling was a much loved form of entertainment for me and my friends growing up. Looking back at an adult though has made me a bit cynical. Watching professional wrestling was one of the many pieces of my childhood that made me who I am today. Unlike a cartoon, it was “real” enough for adults to participate in without being compeltely bored, especially when one considers how outlandish and extravagent the characters were. Who couldn’t laugh at Earthquake and Tugboat, the Natural Disasters, or simply some of the pre-match commentary, even today I find it hilarious. I have to give credit to Vince McMahon for his ability to create a live, modern day circus and in the spirit of capitalism, exploit it to the nth degree. Although it’s been several years, when the film The Wrestler was released, it really hit home on several areas. I realized that I had mentally discarded professional wrestlers. Similar to the toys in my attic, they have been collecting dust and cobwebs for years. The only problem is that each wrestler is obviously a human being. Once us kids, their fanbase, outgrew wrestling, what happens to them? It wasn’t until I watched The Wrestler and also read a few blog articles that I “remembered” professional wrestling. The plight of professional wrestlers marks a nice transition into adulthood. I think when you are just out of college, the taste of freedom, additional education, and quasi-indepdence leaves you approaching the so called “real world” in a very idealistic mindset. This is not something I suggest should be altered, but as I am in my 30s I tend to have a bit more cyniscism now. It was something I would pick up in adults older than me, and well here I am now, with the same attitude. The plight of wrestlers provides the perfect case in point. It’s similar to the final years you beleive in Santa Claus, where you know everyone is pretending but you don’t want to ruin the fun of it. Wrestling was no different. Most of us knew it was fake but the thing is, we wanted to beleive it wasn’t because, well, it was entertaining to watch. Keep in mind that we do this whenever we watch a movie or a play, although most don’t think about it. I bring up wrestling because it represents one of the challenges of being a full fledged adult. Even though many of the moves were staged, what happened behind the scenes was quite real, and frankly sad. Unlike professional atheletes, there is no off-season for wrestlers. Perhaps things have changed, but there didn’t appear to be any type of commission to oversee the health of wrestlers back then. Who knows if it even exists today. The result is that a large percentage of the wrestlers we grew up watching on TV have already died. mostly from cardiac arrest. Until recently I never asked myself what happened to the pro wrestlers I grew up watching. This is where the cynical part kicks in. I imagine most of these guys juiced up to quickly get to a physical level that would look good on camera. They would do their stunts and tricks, making good money I suppose. But what future did any of these guys have after wrestling? And the point The Wrestler drives home is who cares about these guys after their fan base gets older? Do pro wrestlers get retirement packages? The term exploitation comes to mind. As a quick aside, I wish to make clear that one cannot compare professional wrestlers to football, rugby, or other high contact sport atheletes mostly because I assume in the late 80s and 90s the latter received much more extensive and adequate medical treatement than pro wrestlers did. To take the aside just a little further I can’t speak for today’s professional wrestling. I’ve watched it once or twice and found it dull and far more gory than the wrestling I used to watch. All the wrestlers look no different than the guys I see in those muscle magazines. 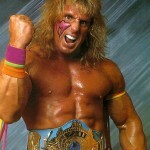 I will sound like an old man but I preferred wrestlers who had their unique personas, similar to comic book characters. Although I admit some of them were used for propaganda purposes (Colonel Mustafa vs Hogan during the Gulf War) or controversial like the Million Dollar Man and his black “sidekick” Virgil, I don’t think most kids will make the connection. The wrestling I see today just looks like a bunch of meatheads beating and realistically torturing each other. Furthermore, the female wrestlers look no different than strippers with gym memberships. Compare the women to Ms. Elizabeth and I think you’ll get my point. It appears today’s wrestling is targeted at a more mature audience which I think is a shame for children. Back to the subject at hand, after discovering how many wrestlers have died premature deaths, my initial reaction is guilt. It didn’t seem worth the cheap thrills when as an adult I know what would happen to most of these men. But I’ve learned to set that aside, it’s fruitless to beat myself up for something I wasn’t aware of. So where does that leave me? Well, it’s why I wrote this article. I’m sure many former fans have come to this realization. I think then, the only thing I can do is be grateful for the entertainment these men provided to me as a child and do my best to honor them.